It seems that almost every article or story about fishing Green Lake sums it up as a very tough lake to fish. Nonsense! But if you come to Green Lake with the idea that you are going to murder its huge Northern Pike or fat Walleyes, most of the time the lake will beat you badly. Its 7,346 acres and extreme depths to 237 feet will humble your ego and cause you to reevaluate everything you know about fishing. The lake is not easy, but it is a very productive fish factory. Green Lake is a lake in which schools of Walleyes and Large and Smallmouth Bass pull the scale down past the five pound mark on the average. It's a lake where a nice Northern Pike is twelve-plus pounds and a Lake Trout under fifteen pounds is small. But the true fishing wealth of Green Lake is in its schools of Perch, Bluegills, Crappies and Catfish that number in the tens of thousands. Most of all, Green Lake's fishing treasure is in the huge schools of White Bass that are measured in acres rather than numbers! These fish run up to three pounds. While the large fish and deep waters preoccupy the trophy hunters, the number and quality of panfish will enchant the basic fisherman in all of us. The "Green Lake is a tough lake to fish" myth will live on if you decide to conquer its trophy fishing overnight. But if you take the time to learn and understand the lake - filling in your fishing knowledge voids with the plentiful, quality panfish present and slowly unraveling the deep water, large fish mysteries - Green Lake will grow on you with a passion. You will become a part of a love affair that the Green Lake fishing lore is made of. * 40 foot pontoon boat equipped with latest electronic fishing gear. * All season sport fishing. * Spring and December houseboat fishing. Summer pontoon fishing. * Large and small parties. The largest Northern Pike in the lake only visit shallow water in early spring to spawn and in late fall to follow the huge schools of Cisco to their shoreline spawning sites. May is their time for a real feeding spree. June & July find them in depths from 14-45 feet. Daily Limit: 5, Min. 28"
Green Lake's main drawing card is the Walleye. Averaging between 5-7 pounds, several Walleyes will be taken each year past the 12 pound mark. Learning the lake is key to good Walleye fishing. Daily Limit: 5, Min. 15"
Green Lake's Trophy Fish. Lake Trout season opens the 1st Saturday in January and runs through the end of September. A DNR survey recorded a 43 pound, 42.3 inch Lake Trout. Summer depths of 65-180 feet. An Inland Trout Stamp is required. Daily Limit: 2, Min. 17"
On light tackle, these fish are perhaps the hardest fighting fish, pound for pound, that the lake contains. Scrappy and oversized. Daily Limit: 5, Min. 14"
Fish near dark when the lake settles to a state of quiet. Sunset to daylight is the time to be on the water. The Bass will be cruising between the docks and shoreline. Size limit: 14"
Green Lake contains hybrid "Tiger" Muskellunge and true Muskellunge. Muskie season is the 1st Saturday in May through November 30. Know the difference between Muskie and Northern Pike. Taking an undersized Muskie could result in a large fine. If in doubt, release the fish. Daily limit: One, Min. 40 "
Green Lake's most abundant and willing fish. Because of Green Lake's deep, clean, cold water, the White Bass are very good table fare all year long. Locate huge schools of Cisco with a fish locator, know the exact depth and use a sharp up and down jerk, the Cisco take the bait on the falling stroke, set the hook on the upward stroke. Work fast, the Cisco never stop moving. Summer depths 85-140 feet. Cats up to 30 pounds have been taken. The Channel Cat is the most plentiful, but the lake also contains Flatheads and Bluecats. Huge schools of Perch roam Green Lake, some are 10-14 inches long, most are 6-10 inches. Summer Perch are in depths of 18-38 feet near weed beds. 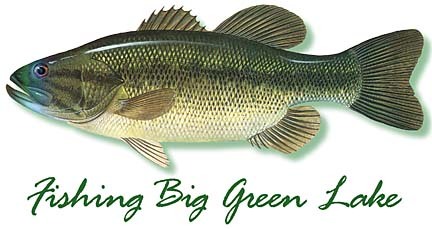 Few lakes offer the quality and quantity of Bluegill that Big Green Lake has. A keeper Gill is 6-8 inches long, going as big as 9-11 inches. Black and White Crappie swim in good sized schools in Green Lake. Ranging from 8-14 inches. They school in tight horizontal layers 18-20" thick by hundreds of feet across. Green Lake has huge schools of Rock Bass, a very aggressive fish that will attack any type of food. Good tasting and hard fighting.